'Raindrop Melody' ( Marty Schafer and Jan Sacks, R. 2003). Seedling S96-3-7. 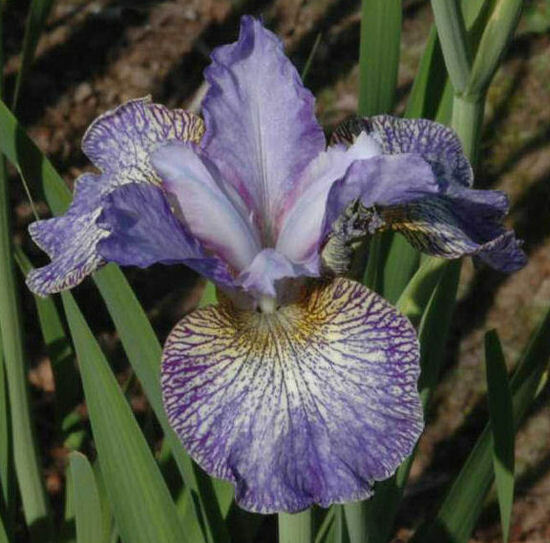 SIB, height 28" (71 cm), Midseason bloom. Standards light periwinkle (RHS 91B/C) dappled and veined violet (90A/B/C), wide dark violet rim; style arms pearly white, purple midrib, aqua and red violet flashes; Falls white washed blue violet (92A/B), darker (93A/B) dapples and freckles heaviest at edge, large white signal with heavy blue violet veining and speckling. 'Blackberry Jubilee' X 'Salamander Crossing'. Joe Pye Weed 2003.